Waller and O'Neill discuss the state of the MS automotive industry. Groups representing Mississippi business leaders say the state could have a harder time attracting jobs if Nissan workers vote to join a union. MPB's Alexis Ware reports. On August 3rd and 4th, about 4,000 employees of the Nissan plant in Canton will choose whether to join the United Auto Workers. Employees who support the union say collective bargaining would improve pay and working conditions. 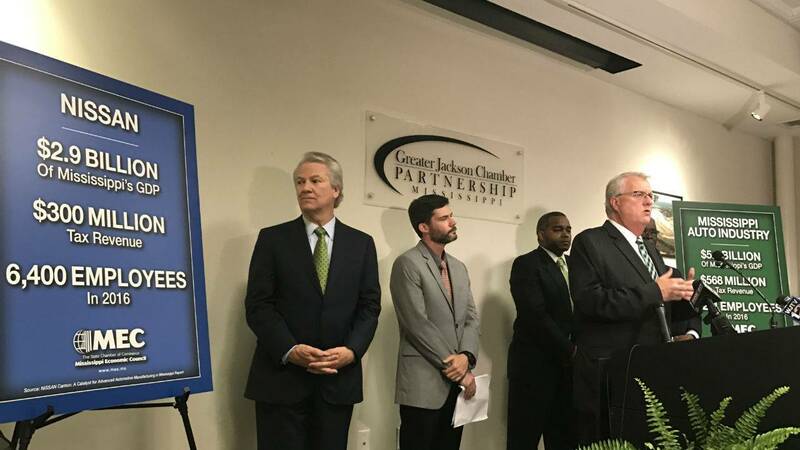 Duane O'Neill is the with the Greater Jackson Chamber Partnership. He says forming a union could prevent future business from coming to Mississippi. "From an economic development person, I am concerned about the possible outcome because of the competitiveness that we now have, the competitive nature that we have in bringing good jobs in the automotive sector to Mississippi." A study by a research center at Mississippi State University says the automotive industry is the fastest growing industry in the state. The industry employs more than 18 thousand people statewide. The average salary is more than 50 thousand dollars, which is higher than the state average. Scott Waller is interim president and CEO of the Mississippi Economic Council. "These are jobs that from the most part weren't there prior to the early 2000s, so it's opened up that opportunity not just to work in the plant but to work in other industries that are supporting it." Waller says Continental Tire's plant's scheduled opening in 2019 is a good sign for Mississippi's booming automotive industry.